On 16 June 1817 “An Act for fixing the Dues, Duties and Payments for all Goods, Wares and Merchandize, landed on or Shipped from the Pier or Quay of the Town of Penzance in the County of Cornwall, and on all Ships and Vessels resorting to the said Pier or Quay, or to the Harbour of Penzance” was signed into law. The act was the consequence of harbour extensions completed in 1813 at a cost of £6,500 and which the corporation sought to offset by increasing their harbour dues which had been at the same level since 1728. On the face of it a reasonable course of action but one which proved to be fraught with problems and disputes, so much so that the Corporation felt that they had no option but to seek an Act of Parliament so settle the matter. Seeking the Act was probably undertaken on the advice of a lawyer, quite possibly Alderman George John, who subsequently undertook to obtain the Act and charged the Corporation £850 for his services. That would be somewhere in the region of £85,000 today. In the near 100 years since the last major change in harbour dues Penzance had changed a good deal with more and different goods passing through the enhanced harbour. The 1817 Act acknowledged that the existing dues “were insufficient and in many cases uncertain” and aimed to fix them for the future by means of a detailed schedule of charges. The passing of the Act made it clear once and for all that the new Penzance Harbour dues first published in 1813 were legal and that not paying them was illegal. A matter which had been in dispute in the intervening four years. As with many similar situations, the collection of the harbour dues was let out to a contractor who paid the Corporation an agreed amount to 'farm' the port dues. Prior to the new arrangements the dues had been let at £700 (1812) and afterwards they were worth £1057, so a 50% increase in income. The Act specified that at least £300 per annum should be set aside to reduce the debt on the harbour. By 1835 the value of the quay farm had increased to £1551. The new pier, completed in 1813, represented an extension of 150 feet which significantly increased the capacity of the harbour but not all vessels wished to pay the increased dues and it became common for ships to “take the ground” on the Chyandour and Larrigan beaches where they could unload free of charge, though not free of risk or inconvenience. 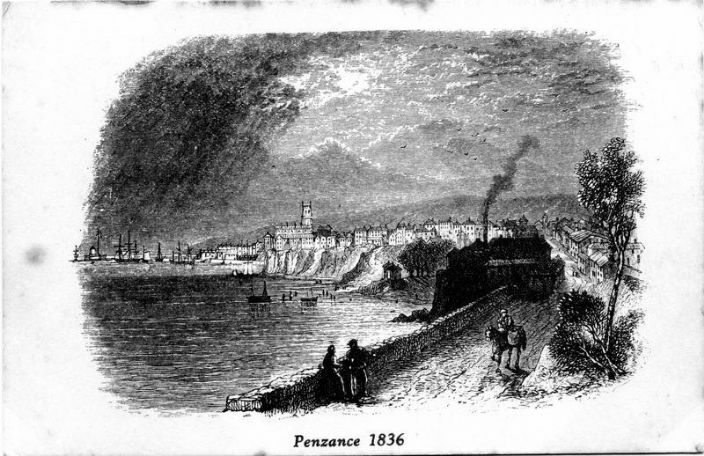 “Penzance 1836,” Morrab Library Photographic Archive, accessed May 24, 2017, http://photoarchive.morrablibrary.org.uk/items/show/14307.